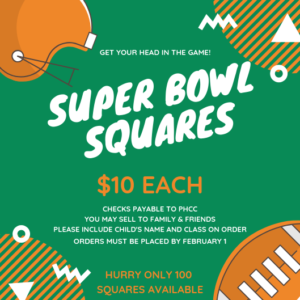 Super Bowl Squares are now available! $10 each- cash or checks made payable to PHCC. You may sell to friends and family- just make sure your child’s name and class is noted in the memo line of the check. HURRY ONLY 100 SQUARES AVAILABLE! Money is due no later than Feb 1st.